Booking = Please book at least 7 working day in advance. Payment = Cash(in CZK or EUR) or credit card(in EUR. Visa/Master) on the spot. We might ask payment in advance if your sum exceeds CZK 5000. Pick up = Our driver and guide will wait up to 20 minutes at the hotel lobby. For pick up at private address(home/office/factory and etc. ), we can pick you up only in case full address and your mobile phone number were provided. The service can be terminated anywhere you wish in Prague(i.e., restaurant, theater, station and etc.) without any supplement. Pick up or drop off at the airport will be a supplement CZK 250/EUR 10. Child seat is available when mentioned in the booking stage or you noticed before your departure. Otherwise we will not provide the child seat and will refuse the service and charge you the full price. Please mention the child's age to prepare the proper child seat. In case our driver cannot meet you at the designated time, we will call you in advance and let you know the delay. If you did not provide your mobile phone number or your mobile is not switched on, we might call the reception and tell about the delay. All passengers must fasten their seatbelts during the whole journey and strictly follow the instructions of our guides. We will charge you 100% in case cancelled less than 72 hours before the pick up. 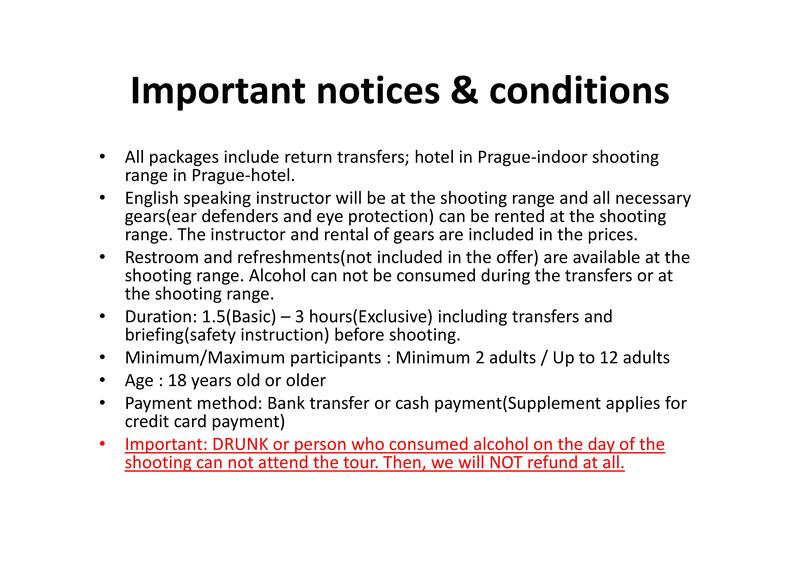 Booking = Please book at least 1 working day(3 working days for international and outside of Prague) in advance. For transfer from Prague airport = Our driver will wait up to 60 minutes after the actual landing time at the arrival hall with the name board. For example, if your flight is scheduled to arrive at 10:00, but landed at 10:30, our driver will wait till 11:30. If landed before at 10:15, will wait till 11:15. If you missed your connecting flight to Prague, please call us the number written in our confirmation. For transfer from hotel or private address = Our driver will wait up to 20 minutes at the hotel lobby. For transfer from private address(home/office/factory and etc. ), we can pick you up only in case full address and your mobile phone number were provided. For transfer from Praha Hlavni nadrazi(Prague Main station) = Our driver will wait you at the platform which your train arrives. Please do not leave the platform otherwise our driver can not meet you. For sightseeing/excursion = Our driver will wait up to 20 minutes at the hotel lobby. For pick up at private address(home/office/factory and etc. ), we can pick you up only in case full address and your mobile phone number were provided. The service can be terminated anywhere you wish in Prague(i.e., restaurant, theater, station and etc.) without any supplement. Pick up or drop off at the airport will be a supplement CZK 250/EUR 10. All passengers must fasten their seatbelts during the whole journey. We will charge you 100% in case of NO SHOW or cancelled less than 24 hours before the pick up/arrival time. We will charge you 100% in case cancelled less than 48 hours before the pick up/arrival time.